This is the first in a series of articles surveying the Bluebell Railway's carriage fleet, which originally appeared in Bluebell News a decade ago. The opportunity has been taken to bring their histories up to date, and to try to indicate the future which lies ahead of them. 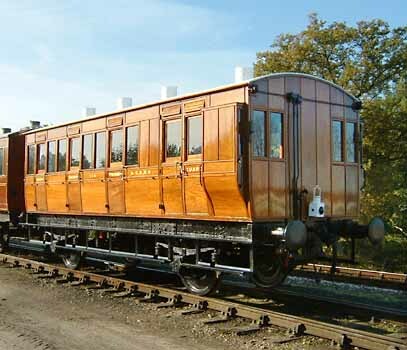 This article deals with our 19th century coaches, excepting the GNR Directors' Saloon, which will be covered later, and the SER Gilbert Car, which is included with the Pullmans. London Chatham and Dover Railway six-wheel brake No 48. The history of this coach, an early arrival on the railway, has been well documented in the past. Suffice it to say that it was purchased out of departmental use, and continued to perform a similar function for a number of years, as the "Alf Brown Gang Tea Room Mk.1". A few years ago it entered the carriage shed, and it was rumoured that it was to be restored. The work force sadly did not materialise, and so it had its tarpaulin replaced and returned to its home in the up sidings. Structurally the coach is in poor shape, and it is completely devoid of an interior. However its six-wheel wooden underframe has received some attention, especially to the centre wheel-set, thanks to the Alf Brown Group. London Chatham and Dover Railway four-wheel brake 3rd No 114. Known as "the Bungalow", the body of this coach rested for many years on the wooden underframe of LSWR van DS1309 in the shed at Horsted, and served as a timber store. Structurally very sound, its restoration was taken on by a volunteer team, with funding from the Bluebell Trust, with the intention that it form part of a Victorian train. A Southern Railway passenger luggage van underframe has been modified to carry it. Restoration commenced in 1998, and it returned to service in November 2006. Further details of the overhaul are available here. Built 30/1/1889 as Second Brake No.106. Body 26' x 8' (9' over duckets) x 6'10". 3 compartments, 30 seats. Wheelbase 15'. Long buffers and Westinghouse brakes. Converted to Brake 3rd No.114, 14/1/1891, fitted with short buffers for close-coupling. Renumbered again as 548 (22/7/1899) in the LCDR continuous number series. Renumbered by SECR as 3068, electric light fitted, 30/11/1903. Close-coupling and Westinghouse brakes retained. Further research, through the South Eastern Society, has revealed that it was withdrawn initially in 1921, but re-instated for hop-pickers specials until 1925. The department's long-term strategy is that it should eventually form part of an LCDR set of coaches to be used with the P-class tank locos, so further grounded bodies are being collected to further this aim. It has been decided to present the coach to its 1891-99 condition as a brake 3rd, since it will not be "as new", and 2nd-class branding may confuse our passengers, who currently face a choice between first and third, which is also how the tickets are printed. London Chatham and Dover Railway four-wheel brake 2nd No 51. As with 114 above, this carriage was built as a brake 2nd in 1889, and soon downgraded to brake third. 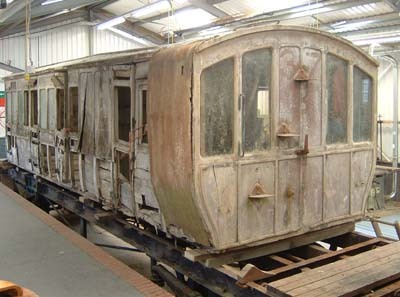 After withdrawal, like many other such carriage bodies, it was sold, without its underframe, for use as a domestic dwelling in Ashington, Sussex. It was offered to the Bluebell when no longer required by its owner, and recovered during August and September 2003 by a team of volunteers. It retains the unusual LCDR pattern of guard's ducket (lookout) at the end on one side. A suitable underframe is available, and will have to be modified in a similar way to that used for other 4-wheelers, by cutting a section out of the end, and re-positioning the wheels, brake-gear and internal structure. 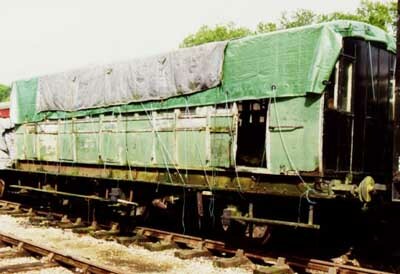 The coach is now stored under a tarpaulin at Horsted Keynes, sitting temporarily on the same underframe which previously supported its near-identical No.114 (see above). One possibility for the long term is that it might be used as a wheel-chair accessible carriage, creating one large compartment from the brake and adjoining comartment. London Chatham and Dover Railway six-wheel third No 668. Built in 1897 as one of a large number of similar coaches to the LCDR's standard design of what might be considered "ordinary" stock, it was subsequently converted into a brake vehicle, probably around 1910. In Southern Railway days it was eventually placed in set 835 - with 12 to 14 similar vehicles, and probably mainly used for excursions or hop-pickers trains, until withdrawn from service in 1935. It was then sold, without its underframe, for use as a domestic dwelling in Yarcombe, Devon, where it remained, lived in, until the death of its owner. 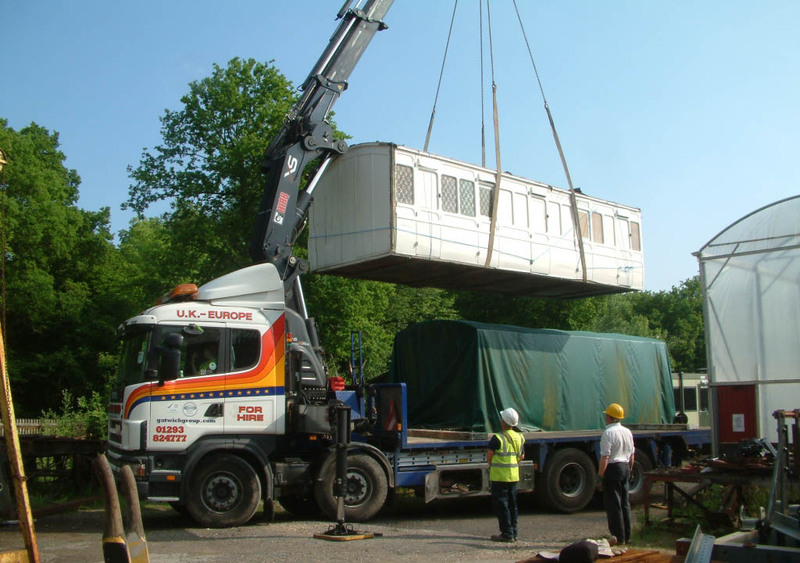 Its new owners made the body available to the Bluebell, where it arrived in 2005. 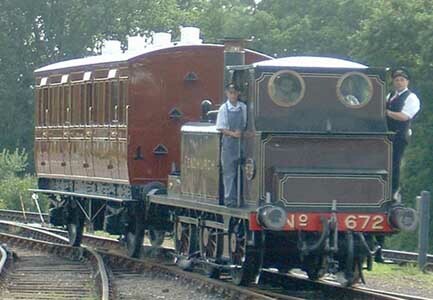 As originally built as a full third, the vehicle is of great interest to the Bluebell, since our aim is to reconstruct a train of LCDR vehicles, and non-brake coaches are in short supply. It thus, potentially has a high priority for overhaul, to join Brake 3rd 114 on our train of Victorian 4-wheelers. 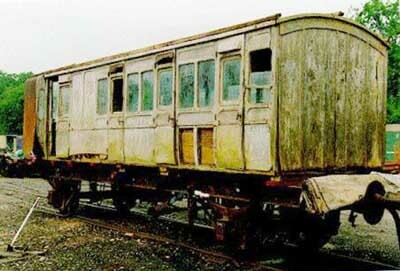 Although built as a 6 wheeler, it may be more practical to restore it using a 4-wheel underframe, and indeed some coaches of this design were converted to 4-wheelers later in their life for use on the Isle of Wight. The coach is stored under a tarpaulin at Horsted Keynes, sitting temporarily on the underframe of former SR Bulleid coach 4035. This coach was one of our early traffic vehicles, arriving in 1963. It was built in 1927 using parts of the bodies of three SER six-wheelers dating from the 1880s, and as such is one of only three preserved coaches of SER origin. It was painted on one side a few years ago for a filming job, but has now been sheeted over and relegated to the up sidings, to free space in the shed. Structurally this coach is reasonably sound, with a complete interior, and would be a prime candidate for restoration, given the work-force and funding (with new doors costing about £400 each - remember it has 20 of them! If anyone feels like sponsoring a door, please contact us). The body style is a passable match to the two birdcage brakes, and the long term aim is that it should form the centre coach of a "Birdcage Trio" set. This vehicle, built in 1891 by the Gilbert Car Company, was later rebuilt as Pullman Car "Constance", and so is included with the other Pullmans. Originally a Stroudley four-compartment first, built in 1880, this coach was rebuilt as a Brake second in 1909, ending up as a brake third before withdrawal in 1924. 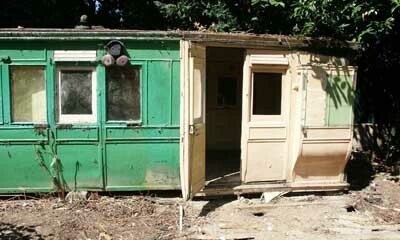 In excellent condition on arrival, the body-side panelling and mouldings subsequently deteriorated in storage. Its restoration was started in 1995, and it has been fitted to a rebuilt four-wheeled underframe. It has been restored to its original condition, with four passenger compartments, since we have plenty of other vintage brake vehicles, and re-entered service in 2004. It is the first of what we plan as a complete train of Stroudley carriages to run with the Stroudley Terriers, Stepney and Fenchurch. Arriving on the Bluebell from farmyard use in May 1998, the two brake coach bodies, dating from 1875 and 1881, were in poor but restorable condition. They have three passenger compartments, and the guard's area has the distinctive Brighton shape of duckets, where the body of the coach is widened to allow the guard to look along the length of the train. Suitable SR van underframes are on site, which will be modified to carry these bodies. In 2004, work started on No.949, which has been completely dismantled, to enable the bottom sides and ends to be replaced. Much of the timbers from the rest of the body are re-usable. 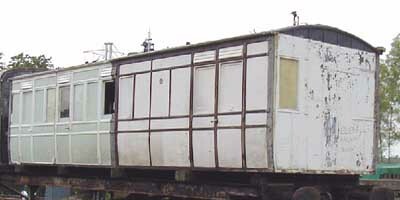 The shortened van underframe was completed in 2005, and the body is now being reconstructed on it. Details of its overhaul are here. The first of these 4-wheel Thirds, No.328, came from Shoreham in 2000, and again was a grounded body. No.992, which is some years older than 328, arrived in 2008; having been in a buingalow in East Wittering alongside a North London Railway carriage. These will enable us to form a prototypical 5-coach set of Stroudley coaches. The photo here shows 328 displayed for a "Brighton" open day with its tarpaulin lifted. The small section of bodyside removed for the domestic kitchen can be seen. 992 is the more complete vehicle, and a photo of it on delivery to the railway can be seen here. In 2008 a volunteer team started to shorten the underframe of a Southern Railway van, to take the body of 328. The oldest carriage in the Bluebell's collection, this Craven-period Second dating from about 1856, is an example of the cramped conditions in which passengers who couldn't afford a first-class ticket travelled in the mid 19th century. Having four compartments, sharing a single oil lamp, and with very little leg room, I suppose one could say that it was better than the stage coaches on the roads, but little more! Withdrawn at a "census", the chances are that it had been out of use for some time before the official withdrawal date. It survived for over a century after withdrawal in a garden in East Chiltington, Sussex, before being dismantled and put into safe storage on the Bluebell. The body, essentially complete, retains sufficient original internal and external features to enable an accurate reconstruction of its original condition to take place, and replacements for the missing external ironwork have already been made. It will form an interesting complement to our train of Stroudley coaches. More information is available on the web page for this coach. This Craven-era passenger brake dating from 1858, was rescued from Preston Park shed in 2008, as a wonderfully complete historic artefact from a very poorly represented era of railway vehicles. The van has a guards compartment (which would have had a lantern roof, now missing) and three luggage comaprtments. It retains its original underframe structure. The main issue for the future with this vehicle and No.35 is whether the surviving historic material should be conserved (and possibly displayed in a museum environment) or restored to as-built, possibly operational, condition, with the loss of so much original material. One solution might be the retention of the original, and construction of a replica, but this is not an issue we need to tackle just at present, since the restoration of either of these vehicles is not yet being considered. 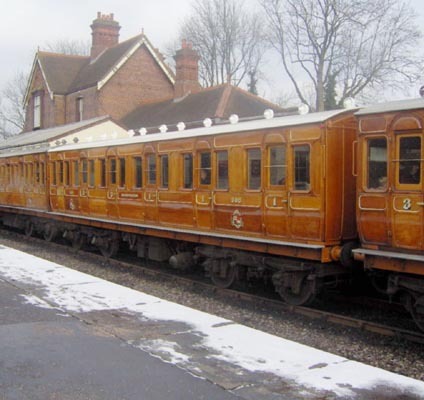 The restoration of the Ashbury stock, also known as the Chesham Set from its use between 1940 and 1960 on the Chesham branch, has been well documented in Bluebell News and on the web site. It is, however, worth stating some of the factual history of this stock, since many publications, from our own stock book to reference books on preserved carriages, have errors when dealing with these coaches. The coach numbers, builders and dates given here combine evidence found during the restoration with details from an article in Bluebell News in 1966 which was researched from original Metropolitan Railway documents. No 394 (518) is a 7-compartment third, built by Ashburys in 1900, it originally seated 70. This was reduced to 60 by the replacement of the end compartment with a driver's cab in 1921. In 1993 it was rebuilt back to its pre-1921 condition. No 387 (512) is the brake third, built by Ashburys in 1898 with 5 compartments; substantially rebuilt in 1907 or 1908 as a driving motor coach with 4 compartments, it was soon found that there was insufficient luggage space, and 10 more seats were lost to form a luggage compartment, these seats being reinstated in 1940. 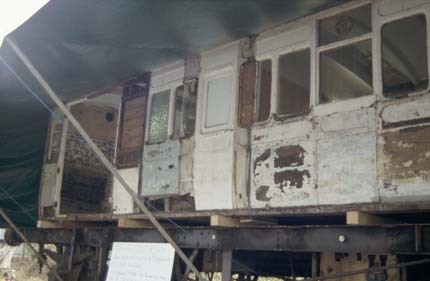 In its current restoration, the van sides have been panelled in teak, replacing the former steel vents, and the brake end rebuilt with the original small windows, in place of the 1907 larger ones. Composite No 368 (515) was built by Ashburys in 1898, and composite No 412 (516) by Cravens in 1900. Both composites have seating for 30 third and 24 first. The first class was down-graded in 1940, involving removal of the folding arm-rests. These have now been reinstated. The coaches are close-coupled within the set, the third having long buffers at the north end, and the Brake coach at both ends. The restoration is to the varnished and lined teak-finish of the Metropolitan Railway as carried in the twenties, involving the replacement of all the plywood and metal panels which have been applied over the years. Work on the interiors involves their reconstruction after the ravages of wear and tear, and dry and wet rot. The running gear is receiving particular attention, probably its first major overhaul in more than fifty years. The first two vehicles re-entered service at the start of 1999, No.368 in May 2002, and the overhaul of the other composite was completed in 2006. The complete set won the HRA C&W award for 2006/7. The second article in this series covers pre-grouping coaches from the period 1901-1923. 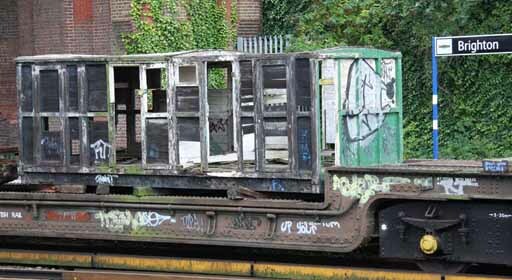 See also the BASH project pages which describe the restoration of the Metropolitan Railway Ashbury stock in more detail. Copyright © 20 January 1996.